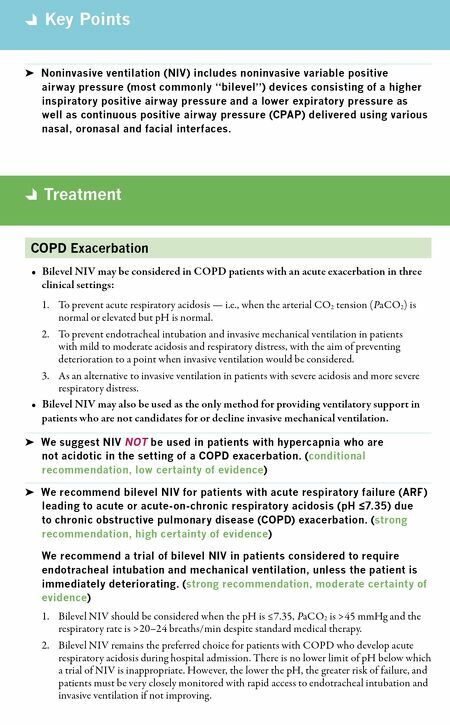 Key Points COPD Exacerbation • Bilevel NIV may be considered in COPD patients with an acute exacerbation in three clinical settings: 1. To prevent acute respiratory acidosis — i.e., when the arterial CO 2 tension (PaCO 2 ) is normal or elevated but pH is normal. 2. To prevent endotracheal intubation and invasive mechanical ventilation in patients with mild to moderate acidosis and respiratory distress, with the aim of preventing deterioration to a point when invasive ventilation would be considered. 3. As an alternative to invasive ventilation in patients with severe acidosis and more severe respiratory distress. • Bilevel NIV may also be used as the only method for providing ventilatory support in patients who are not candidates for or decline invasive mechanical ventilation. ➤ We suggest NIV NOT be used in patients with hypercapnia who are not acidotic in the setting of a COPD exacerbation. 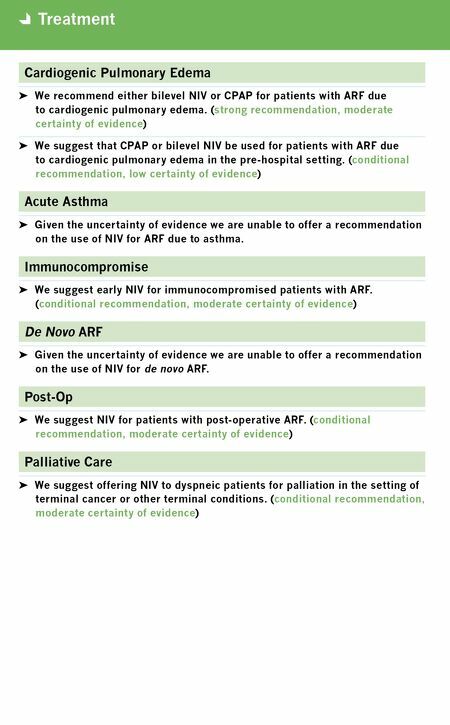 (conditional recommendation, low certainty of evidence) ➤ We recommend bilevel NIV for patients with acute respiratory failure (ARF) leading to acute or acute-on-chronic respiratory acidosis (pH ≤7.35) due to chronic obstructive pulmonary disease (COPD) exacerbation. (strong recommendation, high certainty of evidence) We recommend a trial of bilevel NIV in patients considered to require endotracheal intubation and mechanical ventilation, unless the patient is immediately deteriorating. (strong recommendation, moderate certainty of evidence) 1. Bilevel NIV should be considered when the pH is ≤7.35, PaCO 2 is >45 mmHg and the respiratory rate is >20–24 breaths/min despite standard medical therapy. 2. Bilevel NIV remains the preferred choice for patients with COPD who develop acute respiratory acidosis during hospital admission. There is no lower limit of pH below which a trial of NIV is inappropriate. However, the lower the pH, the greater risk of failure, and patients must be very closely monitored with rapid access to endotracheal intubation and invasive ventilation if not improving. Treatment ➤ Noninvasive ventilation (NIV) includes noninvasive variable positive airway pressure (most commonly "bilevel") devices consisting of a higher inspiratory positive airway pressure and a lower expiratory pressure as well as continuous positive airway pressure (CPAP) delivered using various nasal, oronasal and facial interfaces.